Turning artillery and naval guns into ABM weapons. Hmmm. I meant to put this report in when it occurred in July, but I kept putting it off and forgetting. I actually got a bit of modeling done, and it felt good. Reminded me of why I like the hobby and why it is so sad that I get to do it so little. Started fixing the decals on the Airfix Mustang and did a bit of work on the Takom Siege gun. This really personalizes this story. Actually got some modeling done. Real progress for the first time since the end of January. Man, that is sad. As promised, I am including a photo with this report. Worked on the Takom Siege gun. Also got to reconnect via Skype with famed Canadian modeler Jim Bates. That was nice. It is amazing how a bit of modeling can improve your attitude. I am over a month late in putting this report up. My hobby has ground to a halt, which is killing me. I worked on the Takom siege gun for about 45 minutes. No visible progress. The Navy has unveiled the railgun they have been working on. Story here. 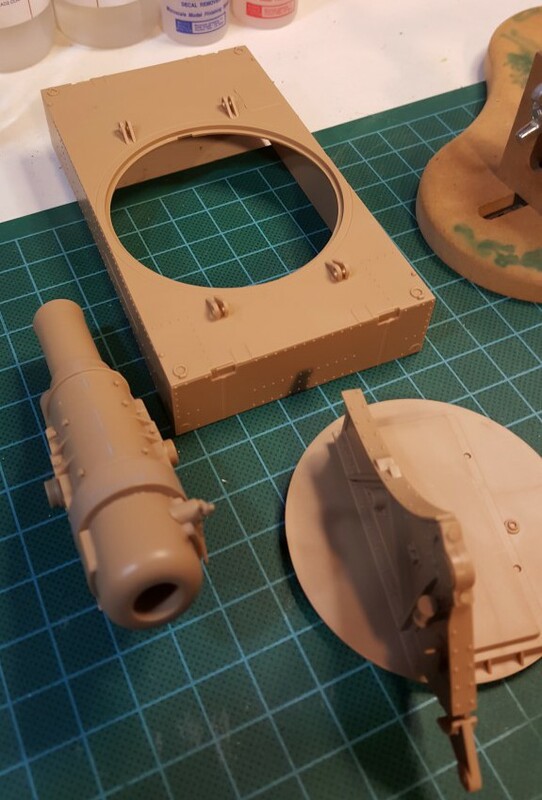 A bit of work on the Siege gun. Not much progress. More work on the Takom Skoda Siege gun. I got the base assembled. This is a bit out of sequence, but the base is in some ways a separate item from the gun and carriage. As of right now, I am averaging 221.24 hours for the year. I know that won’t hold. If I was able to finish the year having done 150 hours, I’d be well pleased. I promise pictures soon.